I just got this great tablet holder from Futur-e-Stick and we love it. 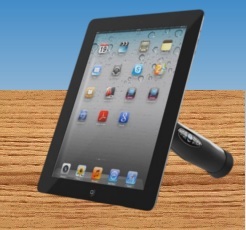 Just attach this to any tablet and you can comfortably hold your tablet. What I love about this holder is that you can adjust it to any angle. You can adjust the holder so that it works in any position you might want. It’s very comfortable to hold as well. I love to read on my tablet but I find it uncomfortable to hold it while I’m reading so with the Futur-e-Stick I can comfortably hold my tablet while I’m reading and my hand doesn’t get tired. It also doubles as a stand. Just prop it up on the table and you have a handy tablet prop so you can be hands free! We love ours! Another awesome feature is that it has a rechargeable USB charger in the handle. So you can easily charge any USB capable device while you are reading and using your tablet. You can purchase the Futur-e-Stick on Amazon!